Leasure first learned of the Six-Word Memoir project in AARP The Magazine in 2010 and says he was “blown away how people could sum up their relationships, loves and lives in just six words.” Now, 4211 Six-Word Memoirs later (and counting), he’s what I call one of the “powerusers”—the site’s most passionate and frequent posters— and a group not shy about debating the ways and means of SMITH Magazine. He’s a contributor to other SMITH story projects as well. Leasure’s piece, “Mercy,” about a car accident that almost killed him, is found The Moment: Wild, Poignant, Life-Changing Stories from 125 Writers and Artists Famous & Obscure (and you can also read a version that appeared on SMITH). 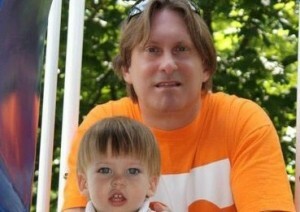 Recently, Leasure, who lives with his wife, Holly, and son, Adam, recently took time to answer six questions from SMITH. 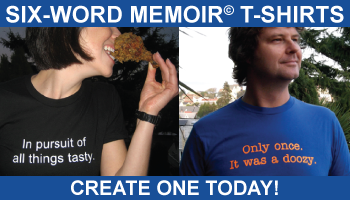 We’re pleased to give him the gift that keeps giving and starts many (more) conversations: the Six-Word Memoir T-shirt of his choice from Spreadshirt. What keeps you engaged on SMITH? I love the power of six. On this site people speak deep truths. They get to the heart of the matter. It teaches me about myself. I make revolutions. I love being associated with great talent. Because I was so shy and stuttered until I was about 20 I can remember always writing poems and letters to girls and of course, never sending them. It was kind of like the Moody Blues song “Nights in White Satin.” Through this experience I fell in love poetry. In my life I have had many turning points creatively. Winning the Marvin Perry Award for Creative Excellence at East Tennessee State University. A fourth place finish for Collegiate Journalist of the Year. Winning the Tyler Hope Award for one of my short stories. Having my cartoons appear in several college newspapers. Articles published in respected trade magazines. Being a toolmaker at Gulfstream Aerospace. Designing and marketing a golf putter and other products. You have a young son who seems to inspire your writing. Can you say more about than or share a favorite fatherhood six? From a snowflake to a snowball. My son is a snowflake child. Adam is documented as the second oldest frozen embryo in the world. He was frozen from 1994 to 2008. For more than fourteen years he lived without a heartbeat. Then my wife’s love found him. He is someone’s mistake. The result of someone not doing their job. He isn’t supposed to be here. He isn’t supposed to be playing with Hot Wheels cars or pulling the cat’s tail. He isn’t supposes to be humming the words to “Smoke on the Water.” He isn’t supposed to be my son, my love. Fortunately love creates miracles that can overcome the greatest of odds. What’s a passion outside of writing? I love collecting vinyl records. I mainly admire writers who wrote before the word processor came along: John Steinbeck, F. Scott Fitzgerald, Jim Carroll, Hunter S. Thompson, Saul Bellow, Tennessee Williams, Ayn Rand, Mark Medoff, Bob Dylan, Tom Waits, Carol Oates Joyce, John D. MacDonald and others. Finally, Steve Leasure, what’s your Six-Word Memoir for today? Double parked in a parallel universe. Amigo, it sure was great to learn more about you. I am glad you are part of the Smith community and best wishes to you and your family. Hi Steve. Nice to meet you. Congrats! Steve, or should I say Superman? You so deserved this honor, keep the memoirs coming. congratulations Steve on the well-deserved feature, and on a beautifully well-lived life. so great to learn more about you and your creative motor. So nice to meet you, Steve. Congratulations, too. I always look forward to and enjoy reading your memoirs - they’re fun, poignant, and, most of all - authentic. Super Guy. Super Dad. Super Friend. Great feature on a great site member. I loved, loved, loved reading about you and the delight you take in your “snowflake” child. Congrats on the feature, one well deserved! You are a top notch guy and I always enjoy reading your sixes. So nice to learn more about you. Of course, that’s in addition to what we learn about you everyday in your sixes. Congrats poweruser! Congrats on the feature Steve! Your son is absoluetly adorable, and it shows that he is the love of your life. Thanks for giving us a little insight to your daily life. What a lovely feature. Congratulations and it always a pleasure to read your memoirs. Congratulations Steven. Your little boy is beautiful. Always loved your memoirs. BanjoDan, thanks for your kind word. To me, you are a modern-day Mark Twain and Will Rogers. Bevvie, you are one of the smartest sixers on the planet. I totally respect who you are as writer and a person. Thank you. JAD, you are such a thoughtful person, I’d love to meet you some day. rabbithole - ahh the Thomas Pynchon of the site. I have never met a writer who is so capable of stretching himself in all directions. You, you sir, have a brilliant sense of style, poetry and humor. canadafreeze - to me, you are one of life’s GREAT mysteries. So giving, so thoughtful, so real. Your kind comments inspire me. And yet I think of you as the Joni Mitchell of sixers. CT - you were my first. ——First sixer to comment on my writings. I love your blog. I’m so jealous of you - because you have a wonderful style all your own - and you’re not afraid to own it. Brilliance dancing in the sexiest of boots. Level1 I love how you write as if the night was yours. Yours to enjoy and to selfishly share. Thanks, you are a beautiful soul. BA —- I adore and appreciate your kind comments. You always know the right thing to say. Thanks. jl333 I “absolutely” love your passion for life and how you always seem to try to live the present. — You are a Present giftwrapped with some of the funniest and most interesting stories. mzejay - the pleasure is ALL mine. Thanks. maryjane31 some of your stories hit is right between the shoulder blades - directly heart-on. steve, i truly enjoyed learning some more about you. also read the story about the car accident and came away VERY glad that you’re still here! you are both talented and kind, and i hope to be reading your memoirs for many more years. LOVED the memoir at the end of this piece! Amazing back story but I would expect no less. It’s always a pleasure to see your avatar and read what you are thinking or laughing about at any given moment. PS I think *I* am in love with your son and am definitely in love with the way you are in love with your wife. How is it that I am the last to know stuff? Congratulations, Steve. You are in a group of what I like to call my sixword roots, those that I started reading and inspired me to join this lovely spot. I love your memoirs. And can not get quite enough of your “Yikes!”. I look forward to this keyhole view of your life for years to come. Thought I knew you. Learned more. So very happy you were featured! Great getting to know more about you, and your family. You six words are so genuine and honest. Congratulations! Nice feature. Your son is blessed to have you as a pappa. Kudos. You are greatly deserving of the title “Member of the Month”. You have said some nice and supportive words to me over the years, and I always appreciated it. I have and and will continue to enjoy your prolific contributions to this site. I would also enjoy a day just talking to you…. Thanks No1Aunt. — You’re the coolest relative I’ve got. Notjust. Thanks - from one incurable romantic to another. Believe - Believe me when I say you are so talented and one of the best things that has ever happened to this site. Thanks. Mary - thank you for being so brave and honest. Thank you for posting that cool (I mean HOT!) ’80s profile pix last night. Thank you for also appreciating Harry Chapin, for inspiring Bruce to write “Thunder Road” , for being so damn thoughtful, for sharing yourself with us. You are such a beautiful person - inside and out. Mourningdove. - You’ve got the coolest name. — I just love your perspective of you, your life and the world. Thanks. sisterpoet - you rock. You write the best backstories. They’re filled so much life, energy and presense. Some of them actually felt are so real and insightful it’s as though you’re experiencing a kind of transformation. Thank you for your kind words. TawnyPort - I think it would be great to someday, somehow, someway meet and just hang out together. Take care. Steve - I’m a big fan of your sixes, comments and the unique insights you share with us, your sixxy friends. This is a well deserved honor. You seem like a very cool dude and I’m happy to have the opportunity to know a little bit about the “real” you. Through your memoirs, I feel the love that you have for your wife and son. It is refreshing to have a man’s loving perspective on love and family. We need more like you. You wrote a most touching comment on my “bike/cane” memoir. Thank you for your contributions to Smithmag. You make me laugh, cry and feel the love. Loved reading this and always love reading YOU! Kudos, my friend. You are one of the first sixers I got ‘to know’ by following your passion for your family and your soulful wit. In many ways I feel connected to you and yes, I love reading your sixes and your comments! Kudos, kudos, kudos. You are lovely. ps: your son is A-D-O-R-A-B-L-E!! Lovely Lizard your comments are allways so thoughtful. I’ve always thought of you as a beautiful flower in a sea of concrete. You are someone who is an original and yet - there is something nostalgic about you. I’m a big fan of you, too. DynamicDbytheC is meant every word I wrote. - You’re one in three hundred million. Loon - my favorite teenager, you and Believe are my favorite all-around writer. You, sir, define this site and this community. Like a wine wine, you are definitely an aquired taste. three-monkeys, I ladmire you and you are one of my favorite. I really miss you. Amapola - you are admorable. You’re my favorite cougar. All of yous postings have a voice of quality and compassion. Steve.I enjoyed reading some of the highlights of your life thus far. Your son’s story is amazing. You are obviously well-rounded, well-read and well-spoken. And I know your left brain/right brain will continue to serve you well. I look forward to more memoirs as you continue on your fascinating journey. Your thoughts on fatherhood, on the miracle of your son, are so beautiful and inspiring. I always enjoy reading the pieces of your mind, but to see the larger part of it laid bare next to your heart puts them in shimmering context. Very nice to meet you. favepeep, thanks for ALL your kind words. I think the biggest problem I have is the inability to acknowledge that life is merely a journey. Redx3, yes he is a miracle, no doubt. Your coment was so brilliantly written - it, too, blew me away.Thank you. Congratulations - You’re a superhero to your gorgeous family and to us Steve!